A very simple but hearty dinner tonight. 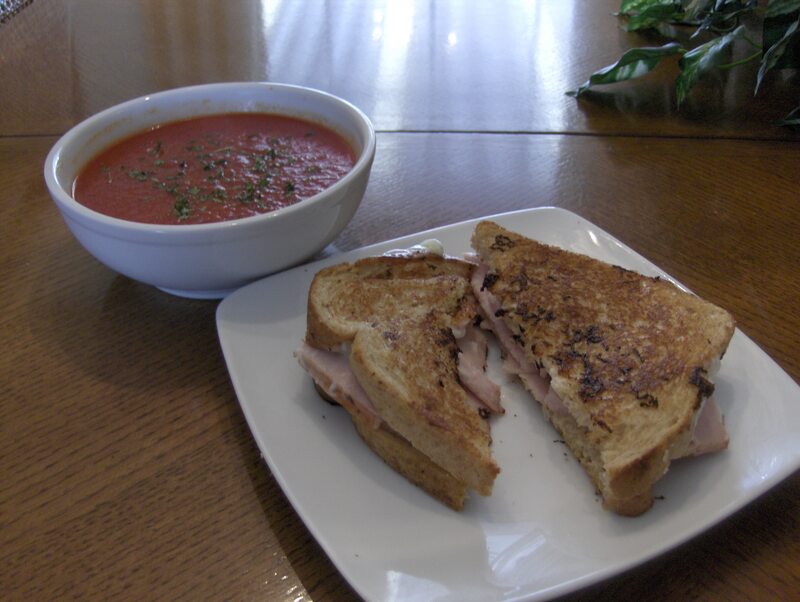 I had Grilled Turkey and Swiss Cheese Sandwich w/ Tomato Soup. I used Aunt Millie’s Whole grain Bread topped with Oscar Mayer Carver Board Sliced Turkey, Sargento Ultra Thin Swiss Cheese, Amy’s Organic Low Fat Cream of Tomato Soup. To grill the bread I used I Can’t Believe It’s Not Butter. Assembled the sandwich with a slice of Swiss, then Turkey, Kraft Reduced Fat w/ Olive Oil, and another slice of Swiss. Buttered the outside of the bread on bottom and top and grilled it in a small skillet till the cheese was starting to melt and bread was browned, flipped the sandwich one time. 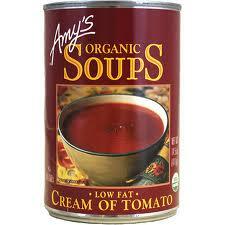 The soup was Amy’s Organic Low Fat Cream of Tomato. Love this soup! Great creamy flavor and only110 calories and 19 carbs. For dessert Breyer’s Carb Smart Vanilla Ice Cream topped with Sliced Peaches. The Peaches are from South Carolina that we had frozen. These have got to be juciest and most delicious Peaches i have ever had! We only have 1 bag left in the freezer so I’m going to enjoy these before their gone. Had a light and easily made dinner tonight. I had a Ground Chicken Burger fried in Extra Virgin Olive Oil and seasoned with Sea Salt and Pepper. I topped the sandwich with 2% Swiss Cheese and Jack Daniel’s Honey Smokehouse BBQ Sauce and served on a healthy Life Sandwich Bun. As a side had a Baked Potato seasoned with Sea Salt and Pepper with I Can’t Believe It’s Not Butter. 3 Tbs Extra Virgin Olive Oil, for frying. *Heat large skillet on Medium heat and add oil. * Roll Chicken in flour, then egg/hot sauce mixture, and then Panko bread crumbs. *Cook Chicken two breasts at a time until done, juices run clear.